Locus festival celebrates fifteen years of passion for great international music, from the 27th of July to the 14th of August in the heart of Apulia, Locorotondo. With four extraordinary shows already on sale with MS. LAURYN HILL, CALCUTTA, FRENCH KIWI JUICE, FOUR TET and BEN UFO, Locus Festival is now adding equally prestigious headliners for free shows in the city square with JOSÉ JAMES, COLIN STETSON, MAMMAL HANDS, LEE FIELDS & THE EXPRESSIONS, COLLE DER FOMENTO, MECNA, dj set on the nearby coast with CHANNEL ONE SOUND SYSTEM, CHILDREN OF ZEUS and CLAP! CLAP!, talk and films on music myths with Locus Focus & Movies, an exhibition of illustrators dedicated to the XV years of Locus, and many other musical and cultural happenings. For its fifteenth edition, Locus festival renews the classic circular logo with the inner fire metaphor, fueled by the passion for good international music. Passion and warmth that made possible the exponential growth of Locus during these years, in that magical heart of Puglia región called Valle D’Itria, in the delightful village of Locorotondo. 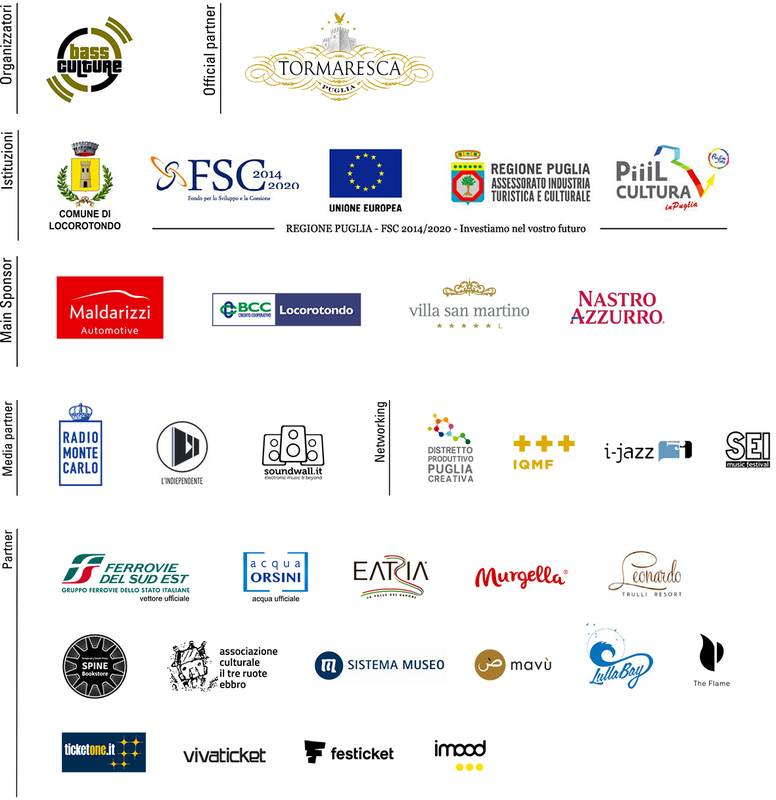 The increasingly high-level of the line-up is positioning Locus among the most important Italian festivals of summer 2019, with the convinced support of local institutions and the official partner Tormaresca, supplier of Apulian DOC wines. Locus festival is conceived, artistically directed and produced by Bass Culture srl, with the collaboration of Comune di Locorotondo and with Regione Puglia‘s support, as part of “Avviso pubblico per lo Spettacolo e le Attività culturali. FSC 2014-2020 – Patto per la Puglia”. Among the main sponsors, we renew the collaboration with Maldarizzi Automotive – Mercedes Benz (Motoria), also as official supplier of production vehicles, and with BCC Locorotondo. An high standard hospitality for artists and guests is guaranteed by Oasi Villa San Martino. This year we’re also welcoming a prestigious brand like Nastro Azzurro. Other important partners and sponsors for the 2019 edition are being confirmed.